Pancakes are a familiar treat in the Netherlands, but Pancakes Amsterdam, which will soon have four locations, differentiates itself by using local ingredients and tapping into pancakes to experiment with various toppings. For instance, traditional Dutch pancakes can be stuffed with ham and cheese; apples, almonds and Calvados; or paprika, mushrooms and bacon.Also served are thicker American-style pancakes and poffertjes, or mini pancakes with sweet accompaniments. Every month, the concept also gives a nod to pancakes from other countries. In May, it was Swedish pancakes with strawberry jam, fresh red fruits and unsweetened cream. 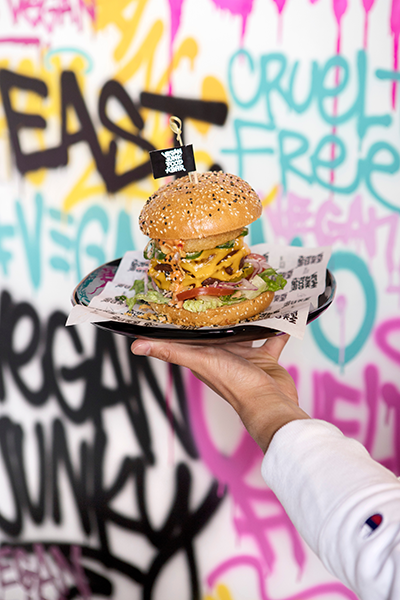 American consumers are increasingly interested in plant-based foods, so we bet they would be interested in Vegan Junk Food Bar, which reminds us of the growing New York City-based chain By Chloe. The concept’s three locations serve items like the Original VJFB Burger, consisting of plant-based beef; cheddar; lettuce; tomato; red, spring and fried onion mix; pickles; and VJFB Sauce, as well as loaded fries topped with meatless shawarma, grated cheese, jalapeños and spicy VJFB sauce. Each of the three units has a different menu. Already making inroads in the U.S., with two outlets in New York City, is JuiceBrothers, which has five locations in its home country. Like its American brethren, this concept serves bottled cold-pressed juices, cleanses and shots, as well as solid foods pumped up with superfoods. For instance, raw chocolate mousse is made with avocado, cacao, coconut sugar, maple syrup and coffee. JuiceBrothers has also collaborated with Brooklyn, N.Y.-based ice-cream purveyors Van Leeuwen.